What is The Pot of the Banjo? Head: The head is the plastic or skin membrane that acts as the vibrating top of the banjo. The head is largely responsible for the unique sound of your new favorite instrument. Rim: Sometimes called the shell, the rim is the circular wooden ring that is the centerpiece of the pot and is made from laminations or blocks of maple or mahogany. A well-made rim is essential to a good-sounding banjo. Tone ring: This part of the pot is a metal circular collar that’s machined to fit on top of the wooden rim, and the head is stretched tight across its top outer circumference. Tone rings come in a variety of shapes and sizes. 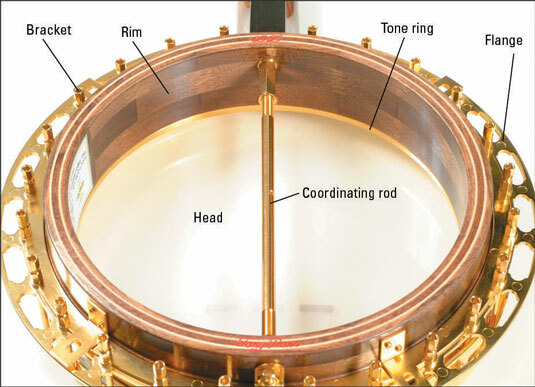 Together with the rim, the tone ring provides the fundamental color of the banjo’s tone. However, tone rings aren’t found on all banjos and having one isn’t absolutely necessary to having a good-sounding instrument. Brackets: Sometimes called hooks, brackets are ringed around the banjo pot and are responsible for tightening the head via the bracket screws that are attached to each bracket on the underside of most banjos. Tension hoop: Sometimes called the stretcher band, this circular metal ring fits over the outside edge of the banjo head and helps to uniformly stretch the head down across the top of the tone ring as the brackets are tightened. Bridge: The bridge transmits the vibrations of the strings to the head. Bridges range in size from 5/8 inch to 3/4 inch. They are movable, but are held fast to the banjo head by the tension of the strings. Tailpiece: This part holds the strings on the pot end of the banjo. Many tailpieces are adjustable in various ways that can subtly affect overall banjo tone. Armrest: The armrest is attached to the pot of the banjo and extends over the top of the banjo head to make right-hand playing more comfortable while simultaneously protecting the head. Coordinating rods: Seen only from the back of the banjo, these rods are attached at opposite ends of the rim, parallel to the banjo strings. The primary function of the coordinating rods is to keep the neck securely attached to the pot. However, they can also be used to make slight adjustments to the height of the strings off of the fingerboard (called string action). Some banjos have only one coordinating rod, and many open-back banjos have what’s called a dowel stick instead of a coordinating rod. Resonator: The bowl-shaped piece of wood that’s attached to many banjos, especially those used in bluegrass music, is the resonator. The resonator projects the sound out and away from the instrument. It’s usually constructed from the same kind of wood as the banjo neck. Open-back banjos don’t have resonators. Resonator screws: Three or four resonator screws keep the resonator attached to the rest of the banjo pot. Flange: The flange is a circular metal piece connecting the pot to the resonator that helps to keep the resonator in place. The banjo pot (as seen from the back).